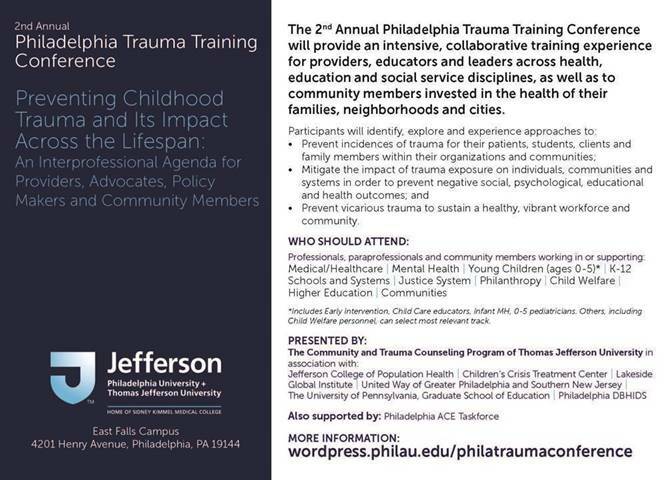 The 2nd Annual Philadelphia Trauma Training Conference: Preventing Childhood Trauma and Its Impact Across the Lifespan, will be held on Thomas Jefferson University's East Falls Philadelphia Campus July 23rd-25th, 2018. 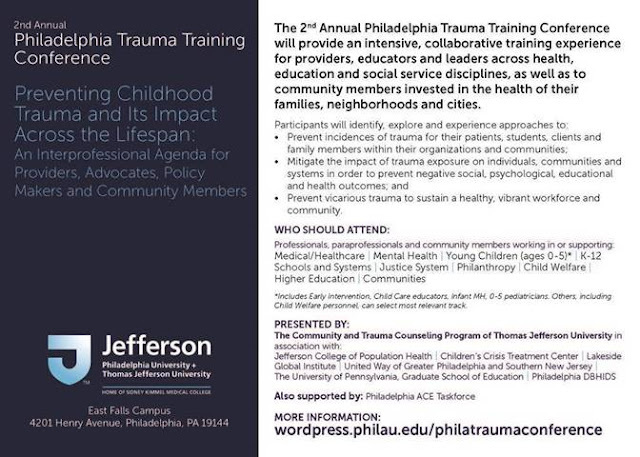 This unique training conference will provide an intensive, collaborative, and engaging experience to providers, educators, and leaders across health, education, and social service disciplines, as well as to community members invested in the health of their families, neighborhoods, and cities. Please visit the conference link for more information about the conference, including registration costs, deadlines (we offer group rates, early bird discounts, and scholarships are available to community and family members), session descriptions, keynote speakers, and an overview of the agenda. CMEs, CNEs, and APA credit as well as continuing education for mental health professionals, early childhood educators, and k-12 educators will be offered, as well as certificates of attendance for students and those who do not need continuing education hours. There are also great opportunities to take a deeper dive through post conference workshops on Thursday, July 26th. We look forward to seeing you in July.